It’s hard to believe that spring has come around once again, and it’s time for a huge clean out and tweaking of the home design to give that summer vibe. Kid’s playroom designs can be the hardest to tackle. You want the area to be fun and colourful so your kids have somewhere to let their imaginations run free, but on the other hand you don’t want the room to stick out like a sore thumb because it doesn’t flow with the design of the home. Why not chose a pirate theme for your modern day little pirate? A pirate theme can be moulded to fit on with a modern home, yet still keep the kids entertained. It can be their own little escape into a different world and you can easily shut the door and forget about the mess. It’s also the perfect solution to keeping that coastal feel throughout the house. Style boards are a great help when deciding on designs and themes for your spring home. It can be tricky to start designing a pirate room as you want it to inspire your little ones but how do you go about that? Designbx’s pre-made style boards can point you in the right direction. 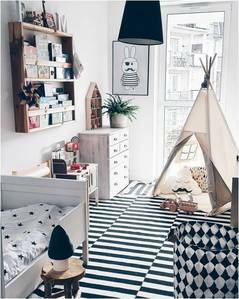 You can easily transform your kids current room into a pirate playland, by simply incorporating black or navy stripes. You can go all out and cover the wall or floor in striped wallpaper or be more subtle and include striped accessories, paintings, rugs and bed covers. Try this reversible quilt cover that is both modern and fits with a pirate theme. Always remember that any accessory placed in a kids room, is going to be used for something it wasn’t intended for. So be careful where you place the accessories and check the quality of them. Sailing ships, telescopes and steering wheels create the perfect combination for your little pirate to embark on a sailing journey through the seas. After playtime is over, simply hide away the evidence in pirate themed storage containers. This can be treasure chest toy boxes or coastal themed baskets. Pictures and paintings can also add to the nautical theme such as this seawood artwork. When your pirate gets back from their big adventure, they will need a bed made for a pirate. Pirate ship shaped beds can make bedtime more inviting. Hopefully helping to avoid the before-bed-tantrums! Although, there are plenty of other ways to turn an ordinary bed into a pirate resting area. Nautical quilt covers are modern and still inviting. Try pottery barn kids’ pirate ship or anchor quilt covers. Also don’t forget to keep the nasty sea creatures away with some bedside table lights. Designbx’s retro lamp is the perfect addition to a pirate’s room, or a pendant shade for even more lighting. 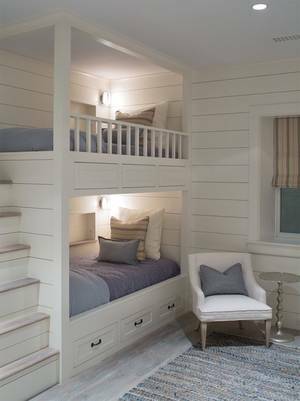 For further ideas on coastal themed homes or kid’s room furniture, Designbx is here to help!